This will be the last official blog post of the 2017-2018 school year. We’ve enjoyed sharing news from across our school district with you throughout the year. Blog posts will resume in mid-August to prepare for the start of the upcoming 2018-19 school year! REMINDER: OFCS will start later this coming school year due to OFHS construction. Please see next item below for exact start dates and calendar link. Enjoy the remainder of this extra long summer in Bulldog Country! To access the complete 2018-2019 OFCS School Year Calendar, please click HERE. Please plan to watch for additional back-to-school information from your respective school buildings as offices reopen in mid-August. Olmsted Falls High School announced this week that, beginning with the upcoming 2018-2019 school year, it will host a new full-day orientation program for all incoming freshmen students as well as students in grades 10-12 who are brand new to the district. This new Freshmen/New Student Orientation Day is scheduled to take place on Thursday, September 6th, 2018 from 8:10 a.m. to 2:46 p.m. All freshmen and new students are required to report for this special orientation event on Thursday, September 6th. Regular bus transportation times will be provided to and from the high school on this date for freshmen and new students. 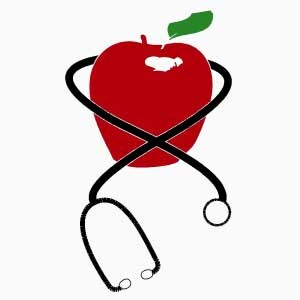 Students will participate in large group and small group sessions, meet with student mentors, follow the entire schedule for the school day, participate in an Activities Fair, complete the health and vision screening required by the State of Ohio and obtain their locker assignment. Lunch will be provided for all students. Students are encouraged to wear comfortable clothes for the busy day! OFHS school counselors, student ambassadors, faculty and staff will be present for this new Orientation Day to help answer any questions and to make sure that all students start the year off knowing they have the support of every adult in the building. PLEASE NOTE: The first day of school for all returning Sophomores, Juniors, and Seniors will now be Friday, September 7th, 2018. Please note that this is a change from the previously released 2018-2019 OFCS School Year Calendar which indicated Thursday, September 6th as the first day of school for students in grades 1-12. OFHS will be hosting a school-wide cookout during all lunch periods on this first full day of school Friday, September 7th. Neighboring North Olmsted School District will again be offering a Summer Breakfast, Lunch & Snack program for children in the community between the ages of 1 and 18 during the summer months. It is FREE to all children ages 1-18. The program runs now through Aug. 17th at various school and community locations in North Olmsted. All meals must be consumed on site. We are excited to report that the progress and pace of construction on the expansion and renovation of Olmsted Falls High School has picked up significantly in the past couple of weeks. With students and staff officially gone for summer, the construction crew was able to double in size from 60 to 120 workers! View of new science/art wing looking into the courtyard to the south from the cafeteria. View of new science/art wing looking to the north from behind the building. This is the new addition on the east side of the building which will house three new business classrooms and a Fab Lab. This is the expansion are on the west side of the building which will enlarge both band and choir rooms as well as provide additional storage space. Did You Know? OFCS Superintendent Dr. Jim Lloyd authors a blog providing insights on decisions that are made and important updates as to what our district is facing in the broader field of education. 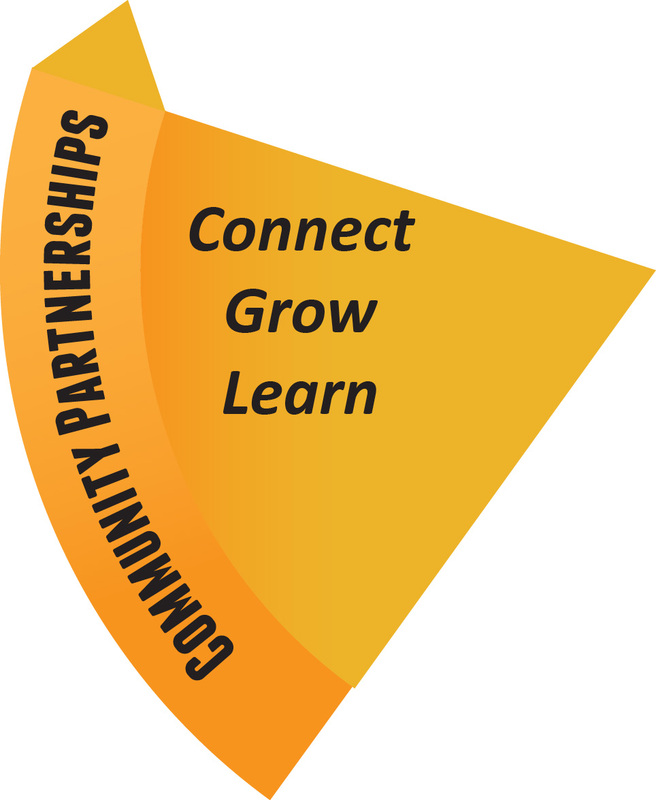 It is simply one more way for residents to better understand what is happening in our schools and how Olmsted Falls City Schools impacts our community. To read Dr. Lloyd’s latest updated posted earlier this week to the OFCS Superintendent’s Update, please click HERE. Congratulations to the 276 members of the Class of 2018! Parents, family and friends gathered at Cleveland State’s Wolstein Center on the evening of May 24th to celebrate Commencement. OFHS Class of 2018 President Daniel Doherty was the featured student speaker. School Board President Joseph Bertrand and OFCS Superintendent Dr. Jim Lloyd also address the graduates and guests. The singing of the OFHS Alma Mater was led by Mary Vukovic and Charles Wendling. As is a tradition in Olmsted Falls Schools, many current faculty members also attended the ceremony, sitting with the graduates on the floor of the Wolstein Center. At the conclusion of the ceremony, participating teachers line the back of the arena floor to wish students well! To view the 2018 Commencement program, click HERE. To read local news coverage about the Class of 2018, please click HERE. Recipients of 2018 Scholarships presented through the Olmsted Falls Endowment and Alumni Association. Thanks to the generous support of more than 90 local individuals, families, businesses and organizations who contributed to the Olmsted Falls Local Scholarship Program this year, more than $137,000 in local scholarship funds were awarded to students in the Class of 2018. This year’s total represents an increase of more than $11,750 as compared to last year! More than 280 local scholarships were awarded to graduating seniors this year, thanks to the generosity of our community! Pictured above are recipients of 2018 Scholarships presented through Olmsted Falls Endowment & Alumni Association. To view the list of Local Scholarship Awards for the Class of 2018, please click HERE. Students in the Class of 2018 also earned an impressive collection of College/University and other scholarships this year totaling close to $1,000,000. Congratulations to all of our scholarship award recipients from the Class of 2018! Best of luck to you all! Congratulations to National Merit Finalist and OFHS Class of 2018 Alumnus Abigail Gaba on being awarded a college-sponsored Merit Scholarship from the University of Cincinatti! This is an exceptional achievement! Bulldog country is proud of you! Congratulations again Abigail! Best of luck at University of Cincinatti! Congratulations to OFHS math teacher Mr. John Vas on being named Teacher of the Year by students in the Class of 2018! Mr. Vas was recognized during the Senior Honor Day ceremony. Each year the graduating class selects a teacher to honor who has had a positive and enduring impact on their lives during the course of their time at Olmsted Falls High School. Congratulations again to Mr. Vas! 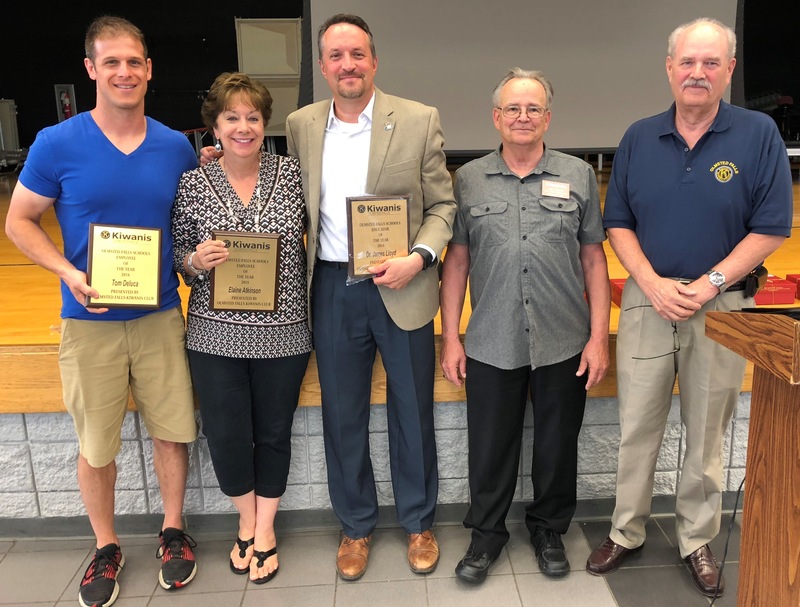 Congrats to Mr. Tom Deluca, Mrs. Elaine Atkinson, Dr. Jim Lloyd & Mr. John Stover (not pictured) on receiving the 2018 OFCS Employee of the Year Awards that the Olmsted Falls Kiwanis Club presented at the staff breakfast. Thank you President Ray Koesel & board member Kris Correll for joining us! RETIREES DEDICATE MORE THAN 225 BULLDOG YEARS TO DISTRICT! Congratulations and best wishes to all of our Bulldog retirees this year! Olmsted Falls School District bids farewell to nine dedicated staff members who retired with the conclusion of the 2017-2018 school year. Their combined service to Olmsted Falls Schools total 227 Bulldog years! 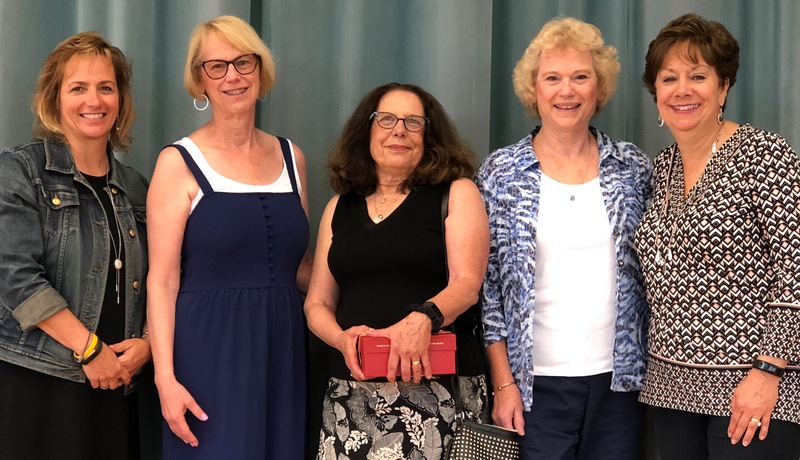 Retirees pictured in the photo are, from left, Michelle LaGruth, Pam Rickard, Kitty Fenderbosch, Mary Lopata and Elaine Atkinson. Bulldog retirees were recognized by their building/departments as well as at the District’s Annual Records Day Breakfast for staff. On behalf of the Olmsted Falls Schools and the Olmsted communities, we extend our heartfelt appreciation to each of this year’s retirees for their commitment to the education and well-being of our children. These valuable individuals and their impact on the District will be greatly missed. Mrs. Wren Timura presented this year’s Olmsted Falls Education Association Friend of Education Award to Mrs. Sandra Graham for her many years of volunteer service throughout the district! The OFEA presents the award annually to a community member who goes above and beyond to enhance the experiences of Bulldog students and staff. Congratulations and much gratitude Sandra Graham! Learning and exploring were still going strong during the final days of the school year! Classroom science lessons came to life in late May as a group of Falls-Lenox third graders embarked on a stream study behind the old library in Olmsted Falls! Students rotated through four different stations to research water speed, water temperature, oxygen levels and animal life. Their explorations helped them figure out if their individual hypothesis to the question “Will this stream support life?” was right or wrong. An absolutely awesome morning of engagement and learning!! Kudos to our teachers and community volunteers that made today’s hands-on learning experience possible! To view a gallery of photos from the stream study activity, please click HERE. To read local news coverage about the Falls-Lenox third-graders field trip to Plum Creek, please click HERE. Kudos to our OFHS Athletic Department for coordinating this week’s Trophy Giveaway of past regular season tournament trophies. Thank you to those alumni and community members who came out to check out the selection and claim trophies free of charge throughout the week. After the conclusion of the last pick-up session this afternoon, and with the help of OFMA President Jamie Reigle, OFHS was thrilled to be able to partner with Super Heroes to Kids In Ohio to donate all remaining trophies to be repurposed and distributed to children battling adversity. OFHS Principal Dr. Holly Schafer was joined by volleyball coaches and players for the presentation of the trophy donation to Batman – our special visitor representing Super Heroes to Kids in Ohio! To read local news coverage about the OFHS trophy giveaway / donation, please click HERE. The Olmsted Falls City Schools’ Portrait of a Graduate committee held its third and final meeting of the school year on May 22nd. Great progress was made as the work group reflected on feedback gathered through a community survey on the direction of their progress thus far. Thank you to this dedicated group of community stakeholders for your active participation in this effort to define the kinds of skills students need to be successful and figure out how to create the learning conditions that cultivate these skills. The Special Olympics 2018 are over – but will not be forgotten! 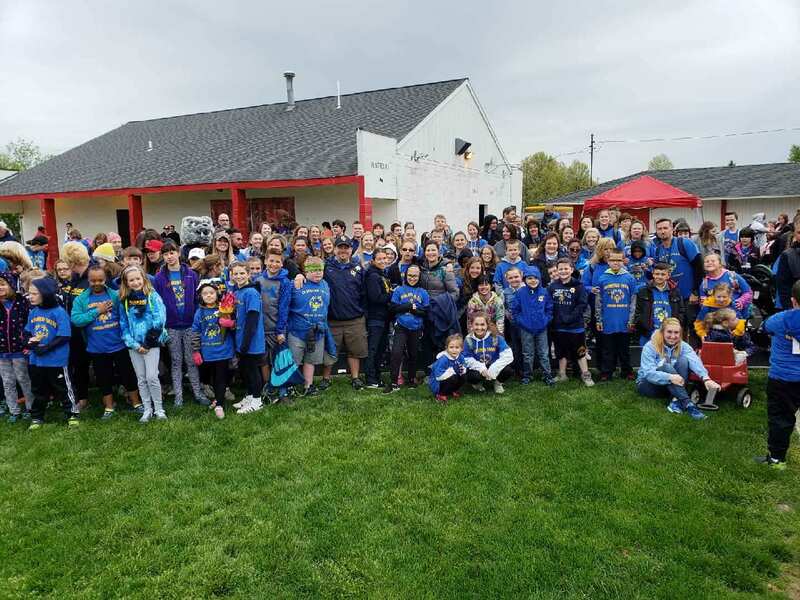 More than 50 students from across the Olmsted Falls School District participated in the annual event hosted at Ely Stadium in Elyria on May 11th. The students competed in various events, such as running, long jump and softball throw. Our Bulldog students practiced hard all year and their enthusiasm and sportsmanship definitely shined throughout the day. Olmsted Falls City Schools had student participants representing all five of our school buildings: ECC, Falls-Lenox, OFIS, OFMS and OFHS. Each building gave its team of Special Olympians an encouraging send-off as they boarded their buses. From the ECC – Evan Frank, Will Henry, Dylan Richmond, Olivia Hargenrader, Grace Sente and David Zamora. From Falls-Lenox – Annabelle Ellis, Weston Holmes, Joshua Peacock, Caeden Peeler, Josh Vassel, Phoenix Novak, Shahan Kapoor, Ellen McManamon, Mack Little, Clay McNamara, Nathan Smith, Jaden Smith, Jacob Komitau and Lleyton Krakowiak. From OFIS – Owen Novak, Yohanna Amoah, Emersen Flynn, Cormac Hannon, Sarah Gaughan, Lily Halan, Imogen Halan, Mya McNamara, Colbie Krakowiak, Anthony DiDonato, Anthony Russo, Jacob Siwek and Zach Vassel. From OFMS – Alexis Andren, Caden Celensky, Johnny Clemons, Emily Heine, Connor Habert, Bilal Saadeh and Connor Halan. From OFHS – Brooke VanArnhem, Maddie Truscott, Mason Mowery, Bekka McElroy, LuLu Mustafa, Matthew Matzelle, Heather Grant, Kennedy Smith and Ashley Michney. CONGRATULATIONS to all of our outstanding local Olympians! You performed well in representing Bulldog Country! A big THANK YOU to the many staff members and volunteers who attended and assisted students in such a fun and safe day! The annual OFHS May Art Show never disappoints! This year’s showcase of student artwork was as impressive as ever – especially the senior displays which allow graduating student artists to further demonstrate their creative talents through personal mini-galleries where their work and personalities truly shine! To view a gallery of photos from this year’s May Show, please click HERE. Kudos to all of our talented Bulldog artists! Thank you to all who attended! And a special thanks to the Olmsted Kiwanis Club for supporting this annual community event! 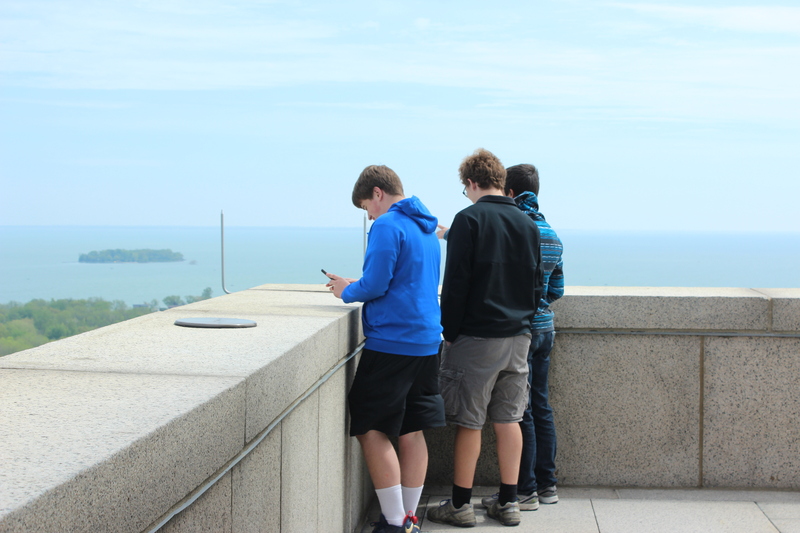 OFHS social studies teacher Mr. John Mercer took his Advanced Placement US History and College Credit Plus US History students to view Perry’s Monument at Put-in-Bay on May 19. They also visited the Confederate Cemetery on Johnson’s Island. Their visits were coined, “Our trip to the Islands,” and provided an opportunity for students to experience history right here in their own backyard! School board member Greg Surtman visited Mr. John Mercer’s AP US History and College Credit Plus History classes on May 25th to discuss his connection with Vietnam. He was born in Vietnam in 1969 and grew up in Toledo, Ohio. It was a great opportunity for Bulldog students to discuss the war and the cultural ramifications of the Vietnam experience. Mr. Surtman also talked about bullying and other pertinent issues from his experience that resonate with students today. 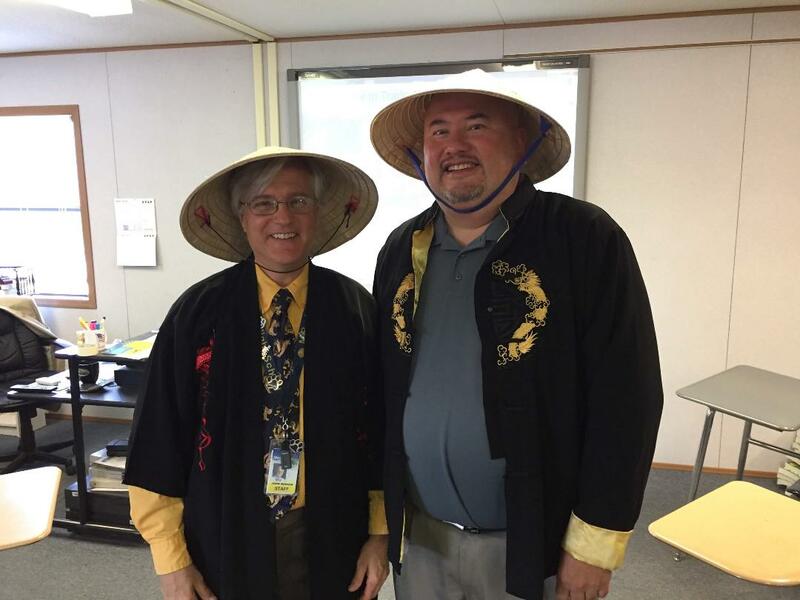 The photo shown here is of Mr. Mercer and Mr. Surtman in traditional Vietnam clothing that he brought to his classroom visits. Thank you to Mr. Surtman for sharing your time and experiences with our students! And thank you to Mr. Mercer for always going the extra mile to bring real-world context to classroom learning! PTA volunteers and staff gathered at OFIS for the annual PTA Volunteer Recognition Dinner last month at OFIS. 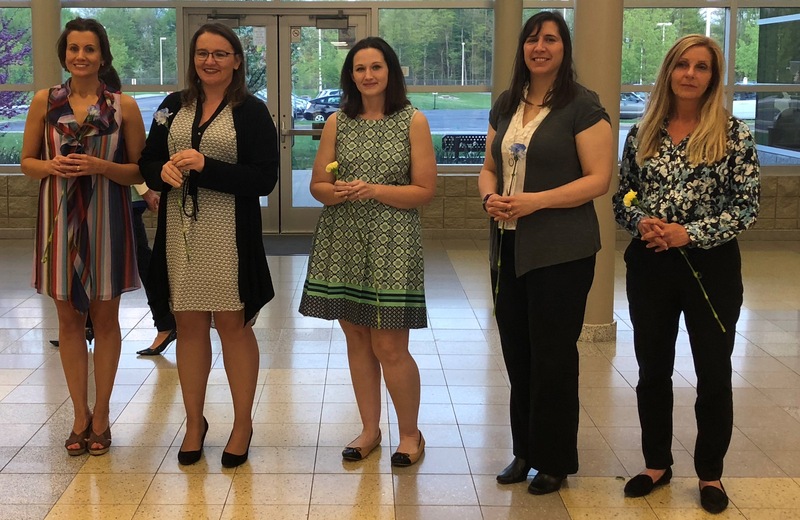 Each year this special event provides an opportunity to thank and recognize PTA volunteers for their time and effort in support of students and staff throughout Olmsted Falls City Schools. In addition, Volunteer of the Year, Helping Hands and Educator of the Year Awards are presented. Superintendent Dr. Jim Lloyd was on hand at the event to express special thanks to these dedicated volunteers. OFHS Golden Expressions also treated guests to special musical performance to kick off the evening. Congratulations to Michelle Smith, who was selected as this year’s PTA Volunteer of the Year. The Volunteer of the Year Awards in each respective PTA unit went to nominees Kimberly Wrobel for Olmsted Early Childhood PTA; Michelle Smith for Falls-Lenox/ECC PTA; Kerry Kramer for OFIS PTA; Lindsay Jones for OFMS PTA; and Kelly Atkins for OFHS PTA. This year’s District Helping Hands Award winner went to Bulldog parent Joy Iannicca, who was nominated by Olmsted Falls Intermediate School PTA. Other Helping Hands nominees recognized this year included Jen Prugar nominated by Falls-Lenox/Early Childhood Center PTA and Robert Reisland nominated by Olmsted Falls High School PTA. Olmsted Falls Middle School teacher Robyn Tenerowicz was also honored as the District Educator of the Year at the event. Building Educator of the Year honorees were also recognized including: Brandy Richmond-Smith for Falls-Lenox & ECC; John Holzorth for OFMS; and Elizabeth Cleary for OFHS. Ohio PTA Reflections winners were also recognized at the event. Congratulations to Award of Excellence in Dance Choreography Avery Caudill, Award of Excellence in Musical Composition Dominic DiFilippo, and Award of Excellence in Dance Choreography Riley Zahorchak. Kudos to these three Bulldog students on their state-level PTA Reflections awards! Congratulations again to all those recognized! 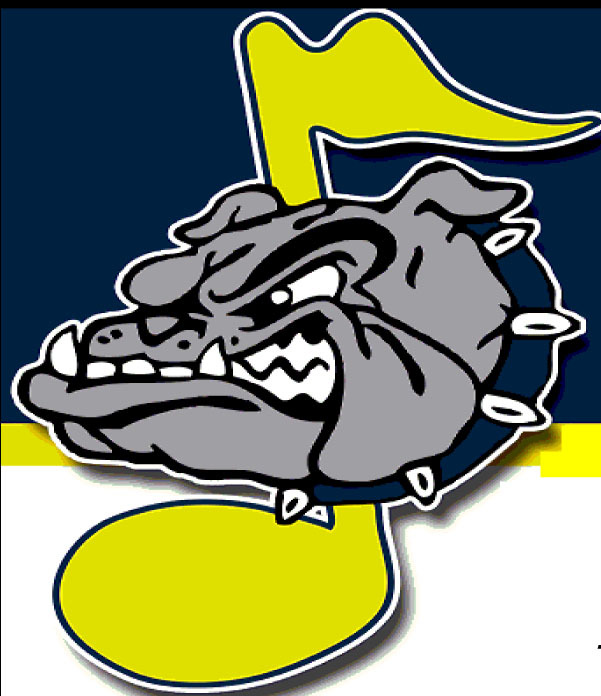 And many thanks to PTA for their ongoing support of the students and staff of Olmsted Falls Schools! Special thanks also to the OFHS Golden Expressions who performed for guests at this event – their last official performance of a very successful school year! Shown in the photo are, from left, Julianne Allen, Tiffany Fischbach, Michelle Smith, Leslie Zeigler and Leanne LaPinta. Not pictured, Colleen Thome. Each of these unit presidents will be supported by an executive board of dedicated volunteers serving in the positions of vice president, treasurer, secretary and council delegates. To view the complete listing of 2018-2019 Executive Board Members, please click HERE. Congratulations to all and thank you for your ongoing support of the students and families of the Olmsted Falls school community! We are looking forward to another fantastic year! KIDS HAVE A BALL AT FALLS-LENOX FIELD DAY! Thanks to FL/ECC PTA and PE teacher Mr. Dame for an amazing day of action and fun!! As the school year came to a close, students at Falls-Lenox enjoyed obstacle courses, kickball, soccer, parachute activities, dancing and more during the annual Field Day event!! To view a gallery of more Falls-Lenox Field Day photos, please click HERE. 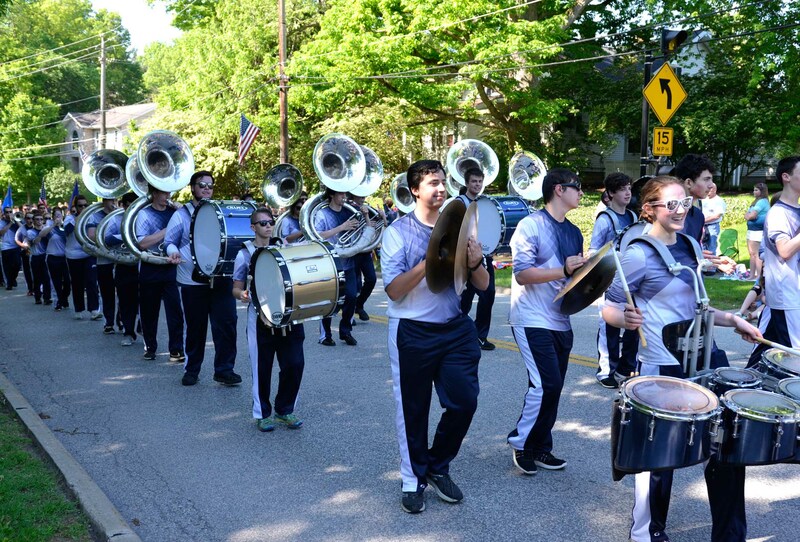 The Olmsted Falls High School marching band made its annual appearance in the community’s Memorial Day parade last month. Two Bulldog students also sang at the Village Green ceremony. Click HERE to see the right side of the band as members march on Brookside Drive and play patriotic tunes To see the band members from the left side as they march on Columbia Road, click HERE. To view OFHS junior Jill Scott sing “the National Anthem” at the Memorial Day ceremony at the Village Green, click HERE. To watch OFMS eighth-grader Greg Smith perform “God Bless America,” click HERE. What wonderful performances they gave those along the parade route and attending the ceremony! Families must pre-register online for the screening. Please click HERE for mCore information letter and link. ATTN: ALL BULLDOG PARENTS! Just a reminder to be on the lookout for an email notification later this summer alerting you to when the portal for returning student registration has officially opened. Once the portal has opened in early August, all student information updates and forms for the upcoming 2018-2019 school year will need to be COMPLETED ONLINE BEFORE THE FIRST DAY OF SCHOOL ON SEPTEMBER 6TH. Thank you in advance for your attention to this important matter as soon as the 2018-2019 portal opens in early August. FORE! 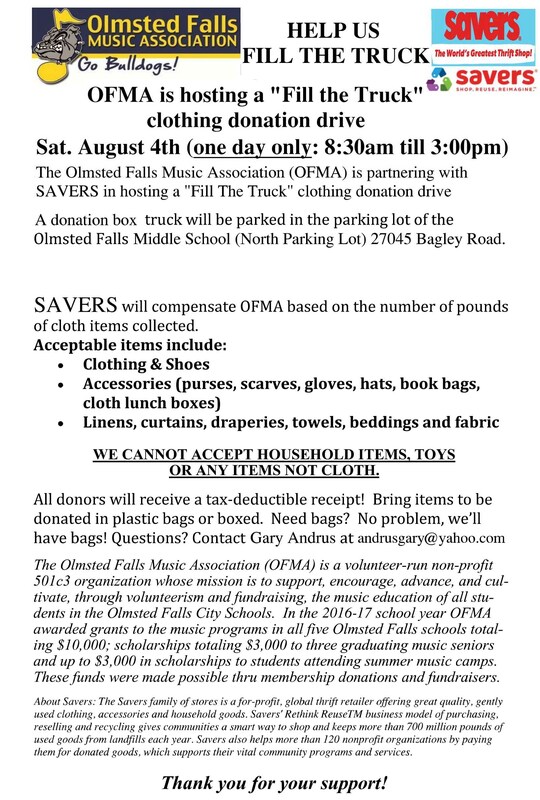 OLMSTED FALLS ALUMNI ASSOCIATION GOLF OUTING – AUGUST 4TH! It’s getting closer! Get your foursome together for the 23rd annual John Sanders Memorial Golf Outing on Saturday, August 4th. You do not need to be Alumni to attend ~ all golfers and wanna be golfers are welcome! $85 per golfer includes 18 holes, riding cart, lunch, beverages, dinner and golf favor. 8:30 a.m. shotgun start, registration and sign-in beginning at 8 a.m. Check out our new website for more details or to register at https://ofhsalumni.com/. Have fun during summer break while helping the FL/ECC PTA. A box top summer fundraiser is so easy. Simply collect 50 or more box tops over the summer for the Box Tops for Education fundraiser. Place them on the attached sheet and return them during the first week of school. You will win a prize. To download the sheet, click HERE. The PTA has several fundraisers set for the 2018-19 school year. Some are the Read-a-thon, Yankee Candle, Muffins for Mom, Donuts for Dad and so many others. To view the dates, details and other important fundraisers for next year, click HERE. These events aid the PTA to earn money to help pay for field trips and various in-school activities. SAVE THE DATES FOR THIS YEAR’S OLMSTED HERITAGE DAYS – AUG. 2, 3 & 4! This year’s theme is “Rockin’ the Falls” and the 3-day event kicks off with the annual Heritage Days Parade on Thursday, August 2nd. Olmsted Heritage Days – Kids Day is scheduled for Saturday, August 4th. For additional details and information, visit https://downtownolmstedfalls.com/heritage-days OR https://www.facebook.com/olmstedheritagedays/.